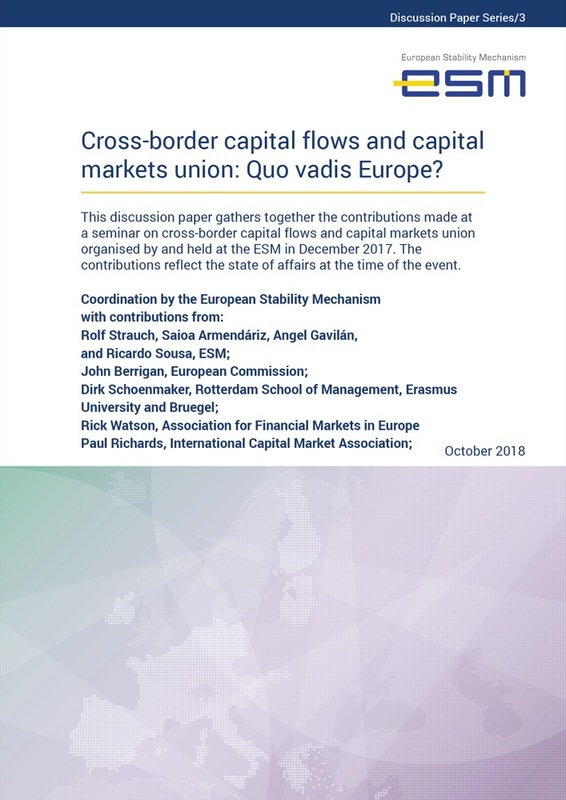 This discussion paper gathers together the contributions made at a seminar on cross-border capital flows and capital markets union organised by and held at the ESM in December 2017. The contributions reflect the state of affairs at the time of the event. Paul Richards (International Capital Market Association). Capital flows may contain information about the build-up of economic imbalances and thereby serve as an early warning signal of an upcoming crisis, as the last crisis illustrated. Cross-border flows both drive and reflect the degree of economic and financial integration across countries. Since deep and integrated financial markets are key to smoothing economic cycles and the effective transmission of monetary policy, understanding capital flow dynamics is of paramount importance for the European Stability Mechanism (ESM) in pursuing its mission to safeguard euro area stability. Much of the euro area’s current reform agenda centres on building more efficient market infrastructures to increase risk sharing through further financial integration. For the time being, however, European capital markets’ financial integration remains limited and the euro area lies well behind the United States in economic risk sharing. This discussion paper gathers the contributions presented at the “Cross-Border Capital Flows and Capital Markets Union” workshop organised by the ESM and held at its premises on 8 December 2017. The workshop analysed recent euro area capital flow dynamics, and discussed how to make the region more shock resistant by enhancing efficient cross-border flows and deepening market integration. The debate benefitted from the different perspectives of closely involved policy makers, academics, and financial industry representatives. We would like to thank John Berrigan, Philipp Hartmann, Paul Richards, Dirk Schoenmaker, and Rick Watson for their work on this joint project.